This story was an adaptation from a Joseph Conrad story, and Conrad was quite a Mariner, before he began to write. I like this story, Maddy. It's very heartbreaking... and, I mean, you just don't know, until they play everything over again from Raz's point of view. Paul does a fantastic job with this character... even down to the cultural, well, not sure if this is the right word, but "eccentricities...," no... that's the wrong word... but... non-British things... that takes the Paul out of the character. Like the physicality, and the slapping, for instance, when his friend comes into his apartment. (My roommate in college was from Poland, and her family was Jewish, and I saw a lot of those traits in Raz that I saw in Katrin and her father). And to top it off, they were law students. Characters after my own heart. It's just a sad commentary on the state of affairs in Israel and Palestine. No matter how old this movie is, it's even sadder that things are the same, if not worse, now. Oh Maddy, bless you--'cause you know how much I these!! I'd post more, but my allotment space is almost full. 50 mb of pics. I may need to upgrade. Yikes! I have plenty more pics. Yes, he is so beautiful in this. His skin very nicely tanned in this movie, I can't remember where they shot it. Berlin and maybe...Israel? He has creamy skin, but he tans nicely. I lightened the pics, because they always get darker when you cap them but he was nicely tanned. Check out that CLASSIC profile, now if anyone should play a Roman or Greek God, it's Paul. I enlarged it way beyond it's resolution to show how CLASSICAL in form, that classic structure he has to his face. Hint, hint, HBO---here's your Roman beauty! 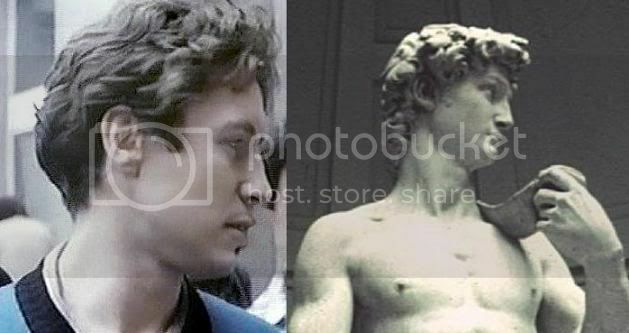 There's David's profile, or Apollo's! Very sad story but still so timely even today. Interesting how the director adapted the Conrad story of betrayel to suit the political situation that continues in the Middle East. If anyone is interested in reading the Conrad original story, Under Western Eyes--I think? you can find it on the Project Guttenberg website. They provide free access to books that are in the public domain--classics and older works---I think anything published before 1928 or so. Or Eros/Cupid! Not the little boy Cupid with wings and a bow and arrow, but the REAL Cupid from the Cupid-and-Psyche story. A splendid example of the Classic profile in all its beauty. Or maybe this? I have a miniature reproduction almost the same as this. I do love classical sculpture... and love real people's faces. Especially noses. I love all different interesting noses. The hole between his clavicles? But Paul is much more beautiful than David. I've never really cared much for David. Does'nt matter Grace, imagination can stick any head on the gorgious ànd so much LESS dressed :-whip: body of David . But the same similarities of their features is there, if not the specifics. Yes, the indentation in the clavical area! The arms...muscular, like a swimmer or runner, but not a gladiator bulked up weight lifter type. 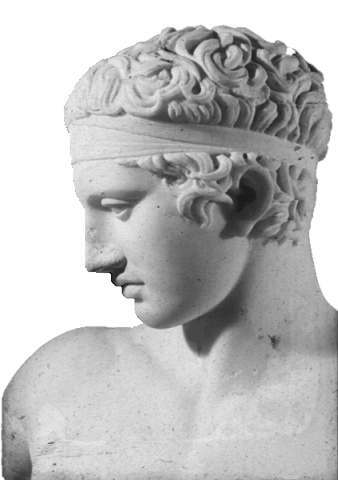 He has that Golden Age of Greece ideal of Classic Beauty that remains throughout time. Classic Beauty! For a Celtic Liverpool lad! Maybe there's some Roman or Greek lineage going way way back! I wonder if anyone has ever mentioned this to him--the similarities. But then again, he sometimes looks like a Filippo Lippi or Sandro Bottecilli portrait, those eyes--the eyelids...very Quatro Cento Florentine! The hole between his clavicles? --it always just looked more like a 'dip' between some nicely defined pec muscles, to me.